We are extremely proud of our graduate student, Ana Maria Anghel, who has received the prestigious award from Cambridge Assessment International Education to acknowledge her outstanding performance in the June 2018 Cambridge examination series. 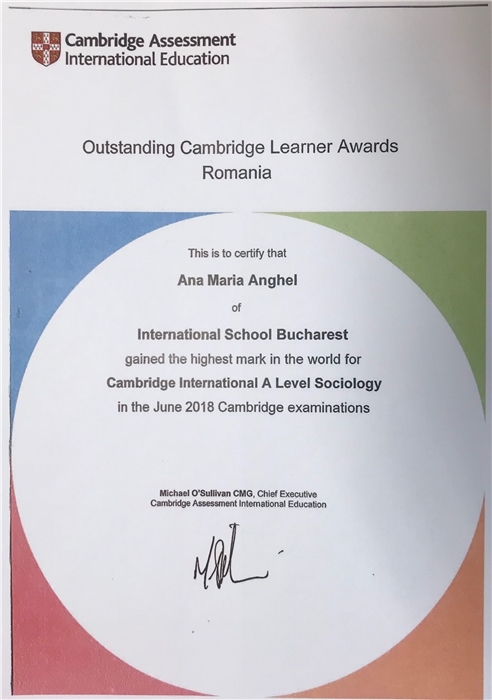 It is extremely rewarding to congratulate Ana Maria Anghel and the teachers at ISB who have worked so hard to achieve tremendous success in Cambridge A Level examinations. Learners from International School of Bucharest have a bright future ahead of them, and we wish them every success in their future.